This article was first published in The Catholic Herald on 8 August 2014. Last month it emerged that the South Korean pop star known as Rain had become a Catholic. The 32-year-old hip-wiggler, Asia’s answer to Justin Timberlake, is one of tens of thousands of people being baptised Catholic each year in South Korea. The Church there has been growing rapidly for decades. In the early 1970s the faithful numbered less than a million; now there are over five million, about a tenth of the population. Pope Francis will be visiting the country for four days next week, and is unlikely to face a hostile press. The Catholic Church has a good image among South Koreans – according to a recent survey it is the most trusted institution in the country. The Church’s vitality is evident at the Korean chaplaincy in Sutton, south London, where 300 people gather every Sunday. The community saved up over decades to buy its own church rather than borrow diocesan buildings – it is the only expat group in Britain apart from the Poles to have done so. When I visit during the week volunteers are putting out flowers and statues of the Virgin Mary for a Legion of Mary meeting. Sister Maria Yu (pictured), who is based at the parish, hands me a thick sheaf of paper – a print-out of the history of Catholicism in Korea produced by the bishops’ conference. It explains that the Church in Korea was founded by Koreans themselves. Confucian intellectuals became attracted to Catholic ideas in the 18th century; one member of the elite was baptised during a trip to Beijing in 1784 and the faith spread quickly on his return. A priest was sent from China after the community realised it could not nominate its own priests. Over the following decades Catholics were pushed to the margins. They lived together in isolated villages and became potters, a trade at the bottom of the social hierarchy. Most of those killed were Korean, although in 1866 a handful of French priests were executed too. The persecution stopped in 1885 after a different faction of the Korean elite gained power and opened the country up to the outside world. Yet the Church did not experience its extraordinary growth until almost a century later. According to Korea experts, the widespread respect the Church has gained has much more to do with its actions in the late 20th century than its persecution in the 19th century. From 1961 to 1987 South Korea was ruled by a dictatorship. During those years the Catholic Church had a central role in the movement calling for democracy. Nuns and priests were on the frontline of protests; a bishop was among those jailed. At the time the Church was led by Cardinal Stephen Kim Sou-hwan, a giant on the national stage who was regarded as a moral authority by all sections of society. Donald Baker, a professor of Korean history at the University of British Columbia in Vancouver, explains that politicians seeking to be elected as president would meet him before announcing their candidacy. At his funeral in 2009, Prof Baker says, the country’s most prominent Buddhist leader bowed before his coffin. Prof Baker, in his essay “From Pottery to Politics”, notes that from the 1960s the Catholic Church also began founding colleges, universities and hospitals. He argues that the era marked a turning away from a “ghetto mentality” caused by persecution to an “awakening of Catholic social conscience”. In this the Church was actually following the example of Protestant missionaries who had set up hundreds of schools and hospitals in the late 19th century. It was through these institutions that Protestantism, and later Catholicism, became associated with modernity. In South Korea in the 1960s, 70s and 80s, says Prof Baker, “to be Christian was to be modern”. Prof Baker, a Catholic and the leading authority on Catholicism in Korea, lives for part of the year in the South Korean city of Gwangju. There, he says, “people brag about being Catholic”. Joining the Church “marks you as serious”, he says. Catholics, in contrast to the born-again Protestants, are associated with “emotional reserve”. He also explains that there is a strong sense of community. People come early to Mass to sing hymns and stay for lunch for two or three hours afterwards. His parish is split into small neighbourhood groups that meet regularly and look after each other. This sense of community is apparent in Sutton. 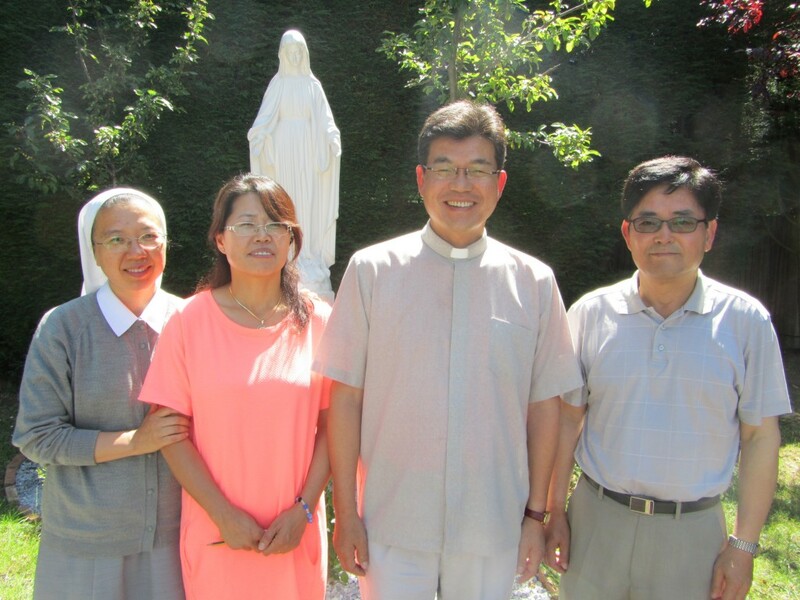 The priest, Fr John Kwon (pictured), who only arrived in November, is visiting the homes of all his parishioners – photographs of him with different families cover the doors of the church. When I visit I am treated to a banquet of squid, pancake, spiced cabbage and all kinds of meats. Albert Chun, the parish secretary (pictured right), explains that going to Mass involves more than “just saying hello”. “We hug together and have personal relationships and take part in small group activities,” he says. Fifty parishioners are members of the Legion of Mary, who meet in groups of 10 throughout the week. Mr Chun says the popularity of the lay group, founded in Ireland in 1921, reflects the deep respect mothers have in Korean society. Members meet in front of a statue of the Virgin Mary, pray the rosary and are heavily involved in volunteer work. Not all Korean Catholics, however, are confident about the future direction of their Church. Fr Denis Kim SJ, a member of the social science faculty at the Gregorian University in Rome, says only a third of Catholics now go to Mass. He also notes that the average age of congregations is rising. “The red light is blinking,” he says. His hope, he explains, is that the visit of Pope Francis inspires younger Catholics and “gives a sense of direction” to Church leaders”.